Three years after Google released its first Pixel-branded Android tablet, it's back with another one. This time it's called the Pixel Slate, but it doesn't run Android 9 Pie. It runs Chrome OS. You wouldn't know it looking at it. 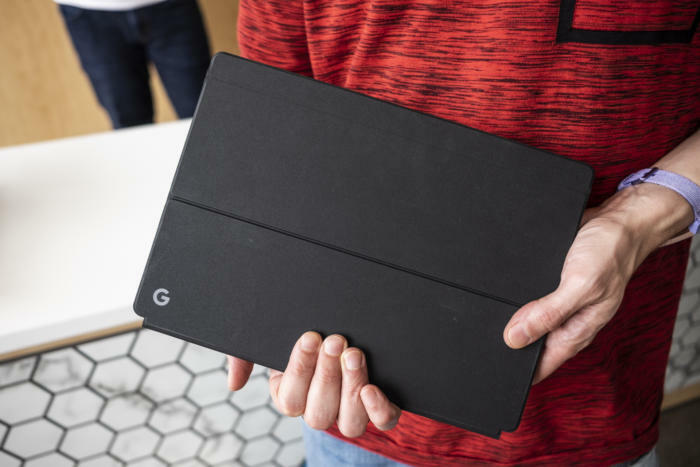 Lying on a table, the Pixel Slate looks just like the Pixel C or any other 4:3 Android tablet, with uniform black bezels all around, four pogo pins, and a USB-C port in the corner. It's only upon closer inspection that you realize just how different the Pixel Slate really is. Your Android and Chrome OS apps are front and center on the Pixel Slate. It starts with the color. Google is offering only one option on the Pixel Slate and it's a good one: midnight blue. It's very dark but not quite black, and has a shimmery quality to it that reflects light nicely. It's one of the nicest colors I've ever seen in a tablet. I can't help but wish it were an option on Pixel 3, too, instead of the middle-of-the-road Not Pink. The Slate has a 12.3-inch display, but its thin, uniform chassis belies its size. I would've guessed it was a 10-inch tablet rather than a 12-inch one, due to its thinness and curved edges that rested nicely in my palm. I rolled my eyes when Google boasted about the "perfectly balanced center of gravity," but holding the Pixel Slate was surprisingly comfortable. It actually does feel lighter than its 1.6-pound weight. Like the Pixel 3, the Slate has front-firing stereo speakers, a rarity on a tablet. It was impossible to test them in the loud demo room, but if they're anything like the Pixel speakers, they'll more than hold their own. The Pixel Slate has a 12.3-inch screen but it's surprisingly comfortable to hold. The display takes up much of the front of the Pixel Slate, and it's a good one. Really good. With 293ppi, it's one of the highest-resolution screens you'll find in any tablet, and it's higher than those in most laptops, too. Google calls it a Molecular Display, which is little more than fancy marketing lingo like Apple's Liquid Retina, but it's nonetheless an excellent screen. But all that awesome hardware would have been ruined if it ran Android Pie instead of Chrome. Chrome OS means that the Slate gets Intel processors (Celeron, or 8th-gen Core m3, i5, or i7) instead of underpowered Snapdragon ones, and a proper UI. The performance improvements over any Android-based tablet will be palpable, especially if you opt for the top-of-the-line model with 16GB of RAM. Chrome OS on the Pixel Slate just makes a whole lot more sense than Android on the Pixel C ever did. 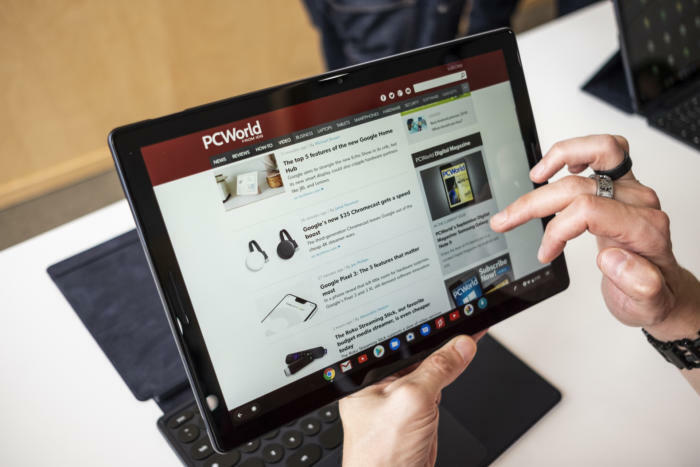 The Android tablet experience has always been something of a letdown, thanks to an interface that doesn't take proper advantage of the big screen and apps that are optimized for smartphones. The Pixel Slate doesn't have that problem. 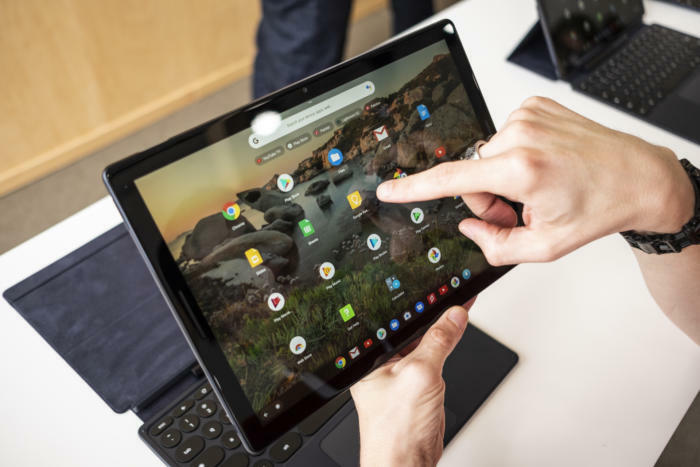 Chrome OS is built for both touch and big screens, and the Pixel Slate's breezy, lightweight interface has been retooled to make the home screen basically nonexistent when using it as a tablet. 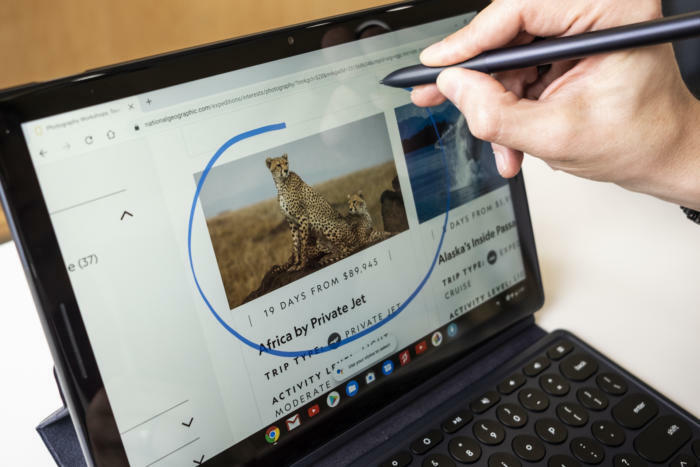 If you circle something with the Pixel Pen, Google Assistant will look it up. For example, when you're using an app, there's no real home screen like on an Android phone. Instead, tapping the home button takes you to the app drawer, and swiping down on the app drawer takes you to the most recently used app. You can switch apps via the dock or the multitasker, but the OS always expects you to be using your tablet for something. It's kind of like if Google took away the ability to press the home button when using Android Pie's gesture navigation. It sounds confusing and confounding on paper, but in practice it's quite intuitive. With no instruction, I stumbled at first but quickly got the hang of it and instantly saw the benefit of bringing the app switcher to the forefront. I'll need more time with it to learn all the ins and outs, but my first impression is that Google is closer to merging Android and Chrome than we think. For example, all the apps I was using were downloaded from the Play Store. 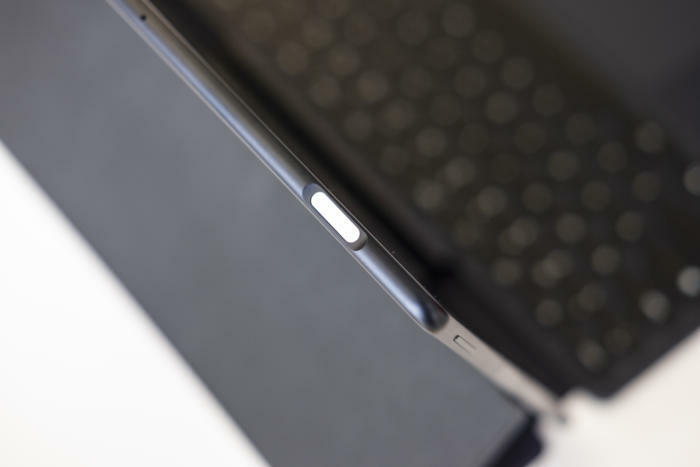 The power button doubles as a fingerprint sensor. Granted, that's nothing new for Chrome OS, but Google is giving them much more prominence on the Pixel Slate. I only had a few minutes with it, but it felt like the beginnings of the Android-Chrome OS hybrid we've been waiting for. There are little Android touches on display all over the Pixel Slate: Do Not Disturb and Night Light, built-in virus protection, Google Play support, background updates, the Titan security chip for "closed loop" protection—but it doesn't feel like a big phone or even a flipped-around Chromebook. The Pixel Slate is an out-of-the-box tablet, but if you connect it to a Pixel Slate Keyboard, it becomes like its cousin, the Pixelbook. The tablet UI gives way to a traditional desktop, and the backlit keyboard encourages you to use the trackpad rather than poke at the screen. Typing on the Pixel Slate Keyboard is as comfortable as it is on the Pixelbook, with good travel for the keys and a soft sound when pressed. You can also use the Pixelbook Pen, which comes in a new color to match the Slate. There's still no place to attach it to the tablet, with or without the keyboard. The Pixel Slate's keyboard wraps around to double as a case. 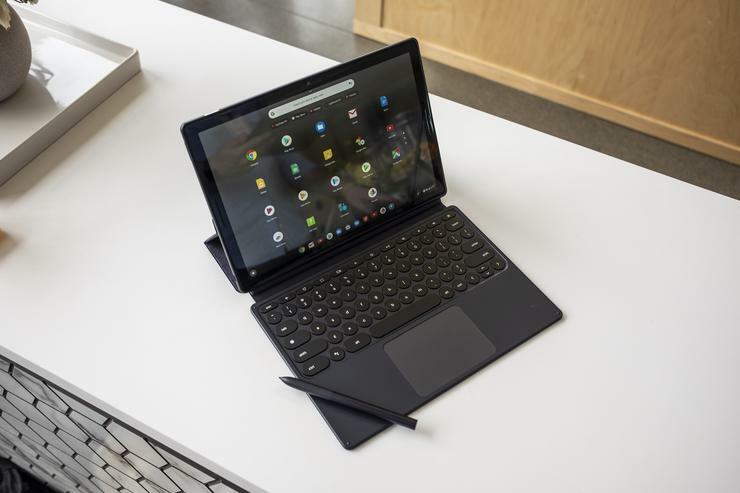 The Pixel Slate starts at $599, but that's obviously for the lowest-end configuration: a Intel Celeron processor, 4GB of RAM, and 32GB of storage. Most people will want to spend a little more on the $799 model, which brings an 8th-gen Core m3 processor, 8GB of RAM, and 64GB of storage, a nice boost for $200. The top-of-the-line model with a Core i7, 16GB of RAM, and 256GB of storage costs an eye-popping $1,599. Add the $199 keyboard and $99 stylus and you're up to $1,899. That's a heck of a lot of money for a tablet. Still, the Pixel Slate might be the start of a new era of computing. Several times during its presentation Tuesday, Google took shots at an interface "that was build for a phone." That a crack at Apple's iOS for sure, but it's as much an admission that Android on tablets just doesn't cut it. Chrome OS, with a little bit of Android mixed in, just might.